Hartzell Propeller has been chosen as the propeller supplier for Northrop Grumman’s new Optionally Piloted Vehicle (OPV), the Firebird. Piqua, Ohio – December 17, 2012. Hartzell Propeller Inc. has been chosen as the propeller supplier for Northrop Grumman Aerospace Systems’ Firebird Optionally Piloted Vehicle (OPV). The Firebird will be the first production aircraft outfitted with Hartzell’s new Bantam™ series ASC-II™ composite propeller. The lightweight, five-blade, non-feathering pusher design propeller weighs just 45 lb. The blades are of Hartzell’s durable carbon monocoque construction, allowing for maximum damage tolerance and field reparability. The propeller blades’ field replaceable co-molded electroformed nickel erosion shield provides impact and erosion protection in a smooth aerodynamic shape. In addition, the strength of Hartzell’s carbon fibreconstruction and its proprietary Vacuum Assisted Resin Transfer Molding (VARTM) process permits the use of thin, high performance airfoils. Northrop Grumman Aerospace Systems, vice-president, Firebird executive program manager, Jerry Madigan, said, “Northrop Grumman selected Hartzell for the Firebird program due to the company’s outstanding record in providing customized, high-performing and reliable propellers. We knew Hartzell could do the job, and do it well. The Firebird’s unique composite spinner assembly uses a custom area-ruled design for aerodynamic pressure recovery – a beneficial feature for pusher designs. Powered by a single rear-mounted, Lycoming TEO-540E piston engine, the Firebird OPV has a maximum take-off weight of 5,000 lb. The craft can be operated in piloted or unpiloted mode. When unpiloted, it’s connected with ground control via multiple wide-band Line-of-Sight (LOS) data links, or Beyond Line of Sight (BLOS) data links. It also features onboard network attached storage and accessible processing available for sensor use, standards-based interfaces and command protocols. Hartzell’s new Bantam™ series of propellers features a family of all-new clean sheet designed very small, lightweight hubs. The series will range between 2 and 5 bladed propellers, feature Hartzell’s ASC-II™ composite technology with optional feathering or reversing capabilities, for both tractor and pusher configurations. An important feature of the Bantam™ series, particularly for some targeted engine applications, is that the propellers have very low rotating inertia, which imparts less strain on the propeller shaft and gearbox. The Bantam™ propellers will be fully certificated by the FAA, and suitable for both certified and uncertified applications. 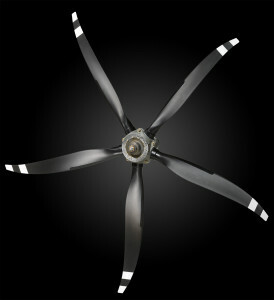 Hartzell Propeller is widely recognized as the leader in advanced propeller design and manufacturing technology. The company has developed the next generation of propellers based upon innovative “blended airfoil” technology and is manufacturing these blades using a combination of revolutionary machining centers and robotics; and with its ASC-II™ composite technology, to provide mission-optimized performance for its customers.